The source appears to be a Facebook post of a man from India with a staggering 380,000 shares from around the world! There are many different species of venomous snakes (and I assume that they mean venomous, not poisonous) and I struggle to see how this could be true. Is it true? Is it true just for snakes in India? No, this is not true. Not even for just India, as Indian cobra (Naja naja) has round pupils and subcaudal (tail) scales are divided. There is also no pit visible. It is venomous species of snake. ... maybe a bit more education hurts even less... but the answer is still no. So to me the description with pits and slit pupils (and also the head drawing) looks like indicating pit vipers. I don't knot about their tail scales, though (and it doesn't seem very practial to me to check...). Pit vipers are venomous. But there are lots of venomous snakes without pits and with round pupils. E.g. the cobras were mentioned already in another answer. There are about 3500 species of snakes. But there are several families of snakes where all species are venomous: Elapidae, Viperidae and Atractaspidinae. There are other Families with venomous and non-venomous species. One family of venomous snakes are the vipers. The great majority [of vipers] have vertically elliptical, or slit-shaped, pupils. pits: the sub-family of pit vipers has them. But then, also many Pythons and Boas (both non-venomous families of snakes) have similar pits. If the drawing in question is trying to distinguish (pit) vipers from other snakes, they are missing the rather distinctive head shape that many vipers have. Scales do not play an important role in distinguishing between the families but are important at generic and specific level. There is no simple way of differentiating a venomous snake from a non-venomous one merely by using a scale character. In certain regions, presence or absence of certain scales may be a quick way to distinguish non-venomous and venomous snakes, but used with care and knowledge of exceptions. 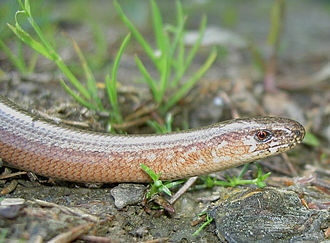 For example, in Myanmar, the presence or absence of loreal scales can be used to distinguish between relatively harmless Colubrids and lethally venomous Elapids. Note though that this distinction tries to use scale patterns on the head, not below the tail. In my region (Germany), there are only 2 species of venomous snakes, both vipers (aspis viper and common European viper) but not pit vipers, and according to the respective Wiki pages they have paired scales on the lower side of the tail... => 2:1 failure of suggested rule. That is a diagram for identifying pit vipers. There are many, many venomous snakes in the world, including I believe all of the most deadly ones, that are not pit vipers. The advice is particularly unfortunate for Australia, as not a single one of Australia's 10 most dangerous snakes are pit vipers. All 10 are instead elapids. The origin of this graphic is almost certainly English-speaking North America. For much, if not all of that area, the only venomous wild snakes are pit vipers. As a kid in Oklahoma I was given these exact instructions verbally for identifying poisonous snakes*. 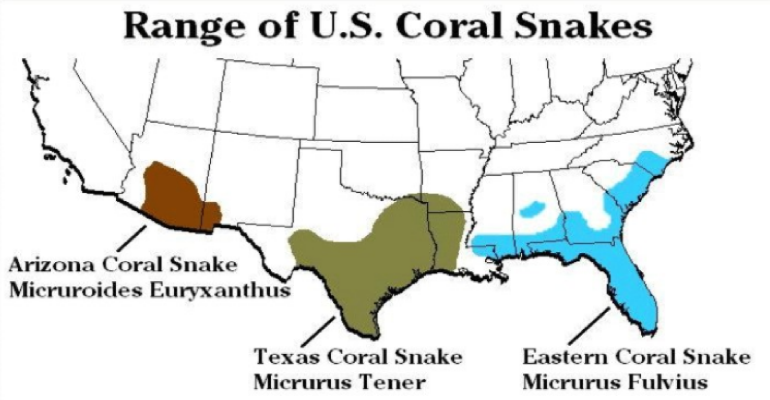 This simplification is possible in the USA because the only venomous snake in the continental USA that isn't a pit viper is the coral snake, whose range is limited to the Southeast, is rarely seen even there, and is generally not aggressive. * - I am repeating the term that was used at the time for these snakes when said people were talking about them. I know its fashionable these days to maintain that "poisonous" doesn't really mean that. For that reason when I'm trying to be technical I'll instead use "venomous". But consider that language is arrived at by consensus, not dictate. If you have to explain to everyone you meet what a word means, you should consider the possibility that it isn't they who are wrong. As answers state, these are signs for some snakes in some parts of the world. The only sign I know that is said to be generally applicable, is a broadening / widening of the head around the side of the skull (as if seen from above) - because poison glands and (for those snakes which have them) additional muscles and anchor points to control fang movement and compress the glands to send venom into the duct/groove in the tooth and thereby into the target can tend to shape the head. 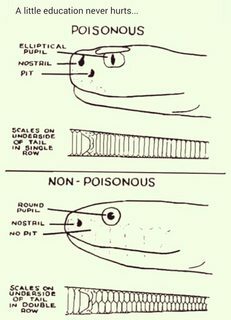 In other words try looking at venomous vs. nonvenomous snake heads from above, rather than from the side, and see if that helps. I don't know how universal that is, but it might stand a chance of being helpful. Or perhaps it's unreliable as well. Another counterexample is the Eastern Brown Snake of Australia (see notes). It has the double caudal scale row pattern of the "nonvenomous" picture. But the counterexample is not my main point. I'd like to raise the following line of reasoning as an indication of why you should treat any assertion such as this with extreme skepticism. And that reasoning is simply to ask yourself how any creature gets to be venomous. It gets that way because of evolutionary drivers: initially through random mutations, its saliva or other bodily fluids exchanged with a foe - either during defense against an antagonist or during bringing down prey - contains proteins or other substances that subdue that foe. This might be, for example, mouth chemistry that is friendly to symbiotic bacteria that produce tetrodotoxin, as in the blue ringed octopus. This effect conveys an evolutionary advantage that is then re-inforced by natural selection. Now, ask yourself how plausible it is that the same evolutionary drivers might affect the skin patterns on the tail at the other end of the body. It's not plausible at all. If there were a relationship such as this picture alleges, there would be a very strong evolutionary explanation for the link (albeit it may not be causal). For example, venom use requires a means of delivery, so it is vaguely plausible that venom carriers might have general facial shape traits. However, none have ever been observed: effective fangs fold up so neatly as to have no effect on the animal's facial shape. Eastern Brown Snake (Pseudonaja Textilis): This one is particularly and extremely dangerous; owing to its venom's action on the blood, you've only got a short time to get the antivenom or at least make sure a compression bandage / limb immobilization is properly in place to stave off a likely fatal outcome. Basically its venom wreaks the same havoc as a massive intravenous injection of factor X would bring about. Not the answer you're looking for? Browse other questions tagged physiology zoology india toxicology . Are sucralose (“Splenda”) and all other chlorinated hydrocarbons toxic? Does coriander juice help in chelation and excretion of toxic metals?